Once again these are actually fortnight notes. That seems to be a cadence that works for me. We entered Discovery with a view to becoming a co-op. This is part of a wider project to sharpen our focus and become better at explaining ourselves to the world. We have always been very mission driven but it has not always been so clear to other people what our mission is. We want to live in a world where every citizen benefits from excellent public services. Our specific role in that is to support public servants, ensuring they have the right skills, tools, and working culture for the digital age. We hope that people who are excited by our mission will want to work with us as Friends, active Participants or even full Members. I’m excited. I visited a lot of local authorities. I’m undertaking user research with people in local authorities as part of a data project we’re working on. It’s been super-fascinating from a data nerd’s point of view. It’s also been fascinating from a culture hacker’s point of view. Every council is different and yet there is something familiar about all of them. There is a distinctive local authority culture. How is this maintained I ask myself? Is it the guard rails of the legal and financial constraints that all councils share? Is it the class of people who run councils? Is it the dominance of particular and distinctly local authority professions? The pervasiveness of a distinct local authority culture should act as a reality check to people trying to transform local public services. Transforming services means adapting cultures and local authority culture is slow to adapt. I went to UK GovCamp. I already wrote about that. We also decided that we’re going to run GovCampCymru again this year. 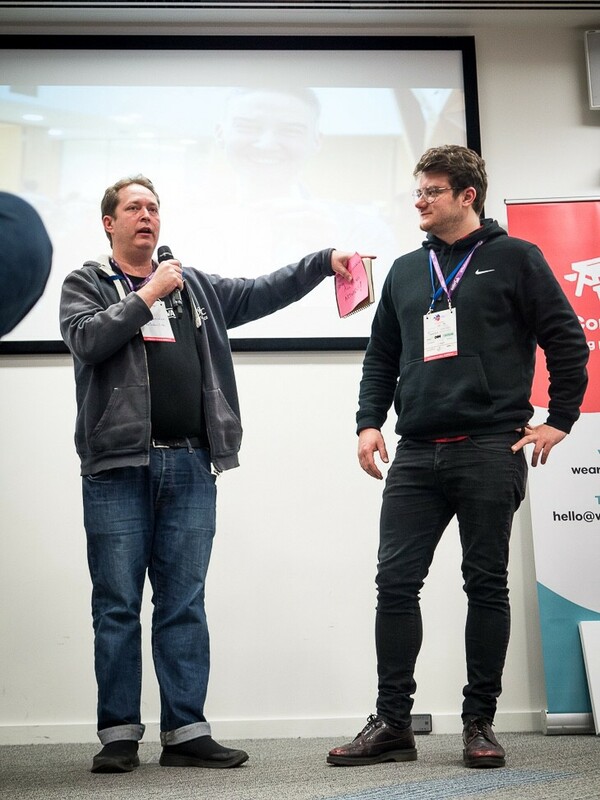 We’re asking people for some opinions on GovCampCymru19. Give us your views if you have a sec. I had an epic series of journeys on public transport including travelling around Teesside on Arriva Buses. This went very smoothly thanks to the awesome power of open data, accessible on-board information, Google Maps and 4G networks. I might write about this somewhere. Had meetings with a view to some very, very exciting projects in Wales which we’re cooking up. Hopefully we’ll be talking about the first of those early in Feb and the other… well, fingers crossed, by the end of Feb. I also met Cassia from DEC to talk about Digital Humanitarianism, and Standby Task Force in particular. And as a result I think we need a simple policy about how The Satori Lab can help with DEC appeals. EMFCamp is going to return to Herefordshire in 2020. I quite fancy trying to organise a mapping village. We’ve experimented with a steps leaderboard within The Satori Lab (recording the number of steps we’ve done each day). I’ve found this quite motivating. We ask people to do really very sedentary work and I think creating a permission structure/encouragement structure to go and take some exercise is very worthwhile. In a similar vein we’ve also introduced the habit of saying what we’re doing for our wellbeing into daily stand-up/check-in and we’ve been experimenting (successfully) with stewarding circles modelled on the approach used by Enspiral. I’m Ben from The Satori Lab. We work to support public servants so they have the right tools, skills and culture to design excellent public services. Get in touch if that’s something you can help with. You may also know me from Twitter where I am @likeaword. Working with The Satori Lab to learn how we can deliver awesome public services in the connected age. Interested in digital, data, dogs, democracy, & DADGAD.